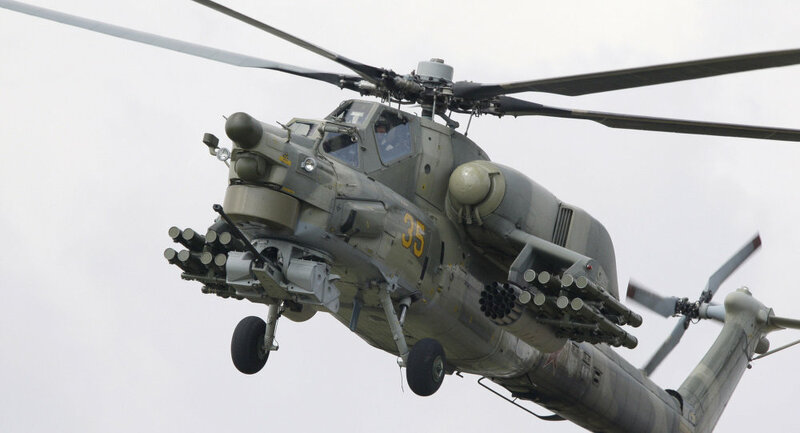 A Mil Mi-28 Night Hunter attack helicopter crashed in southern Russian region of Stavropol injuring two crew members, a police source told RIA Novosti. The crash took place at 10.40 am Moscow time on Tuesday [07.40 GMT], three kilometers from the village of Praskovye in the Budyennovsk district. "According to preliminary information, the engine gearbox broke and the crew decided to carry out an emergency landing," the source said. "The aircraft crashed cabin-first into the ground." The injured crew members, one of whom was knocked out in the crash, were hospitalized. The Mi-28N Night Hunter is an attack helicopter, optimized for destroying armored vehicles and slow-flying aerial targets. The aircraft is robustly built and can withstand crashes involving a high vertical rate of descent.